So says Chase in this, the second book in the popular Diary of a 6th Grade Ninja series, which begins with ‘Talk Like a Pirate Day’. New kid, Carlyle, has Chase’s guard up. Why does he still talk like a pirate when it’s no longer funny? Chase’s ninjas are bored and restless. Now that Wyatt isn’t leading them, there’s no more stealing, no more action. Chase has them all learning ninja moves … but nobody really knows what they’re training for (including Chase). Carlyle seems to be wooing everybody with his funny pirate talk … including Zoe. 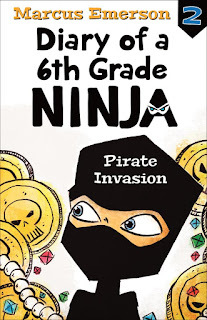 It turns out Carlyle is the leader of a secret band of pirates, and is secretly recruiting Chase’s ninjas. He is also seeking to avenge his cousin’s expulsion from the school. The fast-paced story builds up action in the lead-up to the school ‘Dance Til You Drop’ event. The student who raises the most sponsorship money gets to choose a new school mascot, and Carlyle has convinced his growing legion of pirate fans to hand their sponsorship money to him. Once crowned winner, Carlyle is going to change the school mascot to a buccaneer. Can pirates really trump ninjas? Does Chase even have the willpower to stop them? Poor Chase. It seems the more he tries to disappear, the more he stands out. After a talk with his dad, Chase decides to revolt against the crowd and stand up for what he thinks is right … in an absurdly funny obstacle course showdown. The novel concludes with Chase learning another lesson in leadership, Zoe demonstrating her family loyalty, and Carlyle planting a rumour that good old Wyatt is set to return.